Sometimes, the best part of a trip to Disney World is an afternoon (or several) at the hotel pool! Dive into vacation fun at one of these amazing Disney World hotel pools for families. 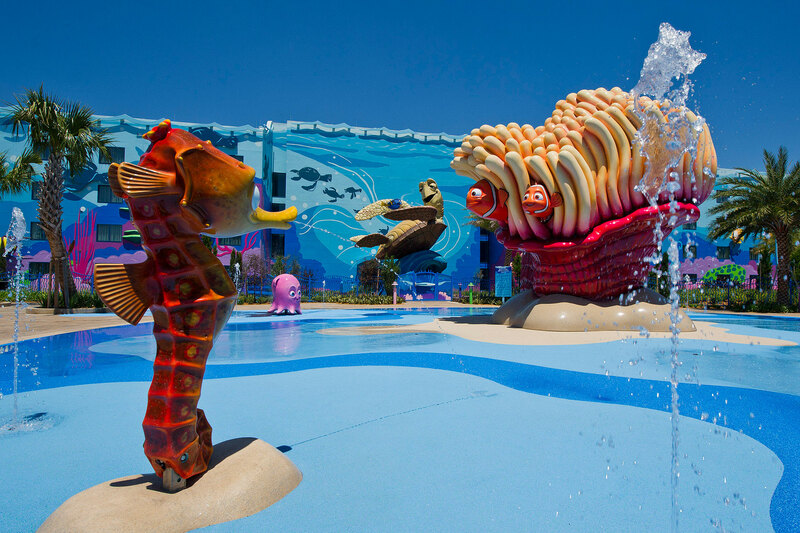 The only zero-entry pool at a Disney Value resort property, the Big Blue Pool at Disney’s Art of Animation Resort has about 310,000 gallons of liquid cool, as well as colossal soft sculpture characters, from giant jellyfish to a massive Mr. Ray. An underwater sound system broadcasts showtunes and comments from favorite film characters, and adjacent wet and dry play areas entertain little ones for hours. In the afternoon, the party heats up on the pool deck. Planned activities range from party games to trivia challenges, and pool celebrations, dance parties, and arts and crafts time are offered daily. When the sun goes down, guests can watch favorite Disney films on an inflatable screen and order up smoothies and cold drinks at the Drop-off Pool Bar. Check the monthly recreation schedule for details. Access to the pool is controlled by key-card entry. 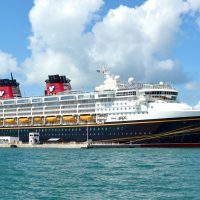 Unparalleled in splash-happy Disney fun, shipwreck-themed Stormalong Bay at Disney’s Yacht & Beach Club Resort is the ultimate water wonderland. The three-acre sandy bottom swimming pool features a 230-foot waterslide that’s thrilling for tweens and teens, a meandering lazy river, and a toddler-friendly shallow area and sandy beach ideal for busy diggers and toe-dippers. In short, it’s the ultimate multi-age kid-pleaser. Daily activities are hosted by recreation staff, and there’s a separate wading pool with a miniature slide for little ones. The sprawling complex is gated, as well as guarded–nearly 20 lifeguards are on duty. The Aloha spirit is unmistakable at the Lava Pool at Disney’s Polynesian Village Resort, thanks to tropical landscaping, a Tiki-themed water play area for children and a pool bar and adjacent Tiki Terrace, where you can order up refreshing tropical juices or a spiked pineapple Dole Whip treat. 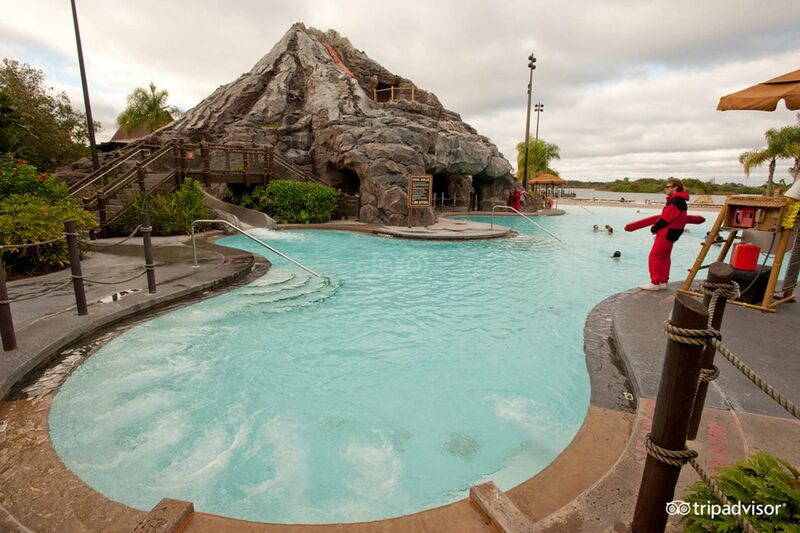 Remodeled in 2015/2016, the resort’s Lava Pool offers a rebuilt volcano with a built-in, 42-foot waterslide, a scenic waterfall and an extensive Kiki Tiki’s splash play area, which is quite possibly the best sprayground for kids on Disney property. An evening dip in the zero-entry Lava Pool– from which you can view the nightly Wishes fireworks show-is a magical way to end your Disney day. A favorite among families for its multi-age water play area and secluded setting, Samawati Springs Pool is smaller, but in many ways, even cooler, than the feature pool at the adjacent Jambo House Lodge. Uwanja Camp sprayground is an animal observation-themed water wonderland, with dedicated areas for children ages 4 and under (Observation Station), 5 to 7 (Departure Zone) and 8 and up (Base Camp). You’ll find squirters, dump buckets, water cannons, and animal puzzles–all designed to encourage active play while squashing sibling rivalry. The 18,138-galloon, lushly landscaped Samawati Springs Pool features zero-entry access and a winding 128-foot waterslide. You can book a premium poolside cabana, watch the kids splash in the “Alice in Wonderland”-themed water play area, and join in on a daily “Un-birthday Pool Party” fun at Disney’s Grand Floridian Beach Pool. 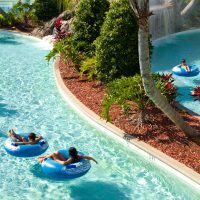 Overlooking the scenic Seven Seas Lagoon, the zero-entry pool evokes a natural springs ambiance and features a 181-foot long waterslide and a grand waterfall flowing from a 27-foot-tall stone mountain. For doting grandparents (or parents) traveling with young Disney fans, the lavish lounging ground is a serene and refreshing Disney summer getaway. With beautiful Bay Lake as a backdrop, Copper Creek Springs Pool at Disney’s Wilderness Lodge is a natural favorite. Seemingly carved out of the rockscape, the resort’s showcase swim area includes a feature pool with a 67-foot waterslide and a sizeable sun deck, an adjacent children’s splash area, and both hot and cold tubs. From early afternoon to evening, enthusiastic recreation leaders pump up the energy on the main deck with music, games, and prizes. A five-story Mayan pyramid, which anchors a 123-foot-long, jaguar-inspired waterslide, towers over the Lost City of Cibola Pool at Disney’s Coronado Springs Resort. 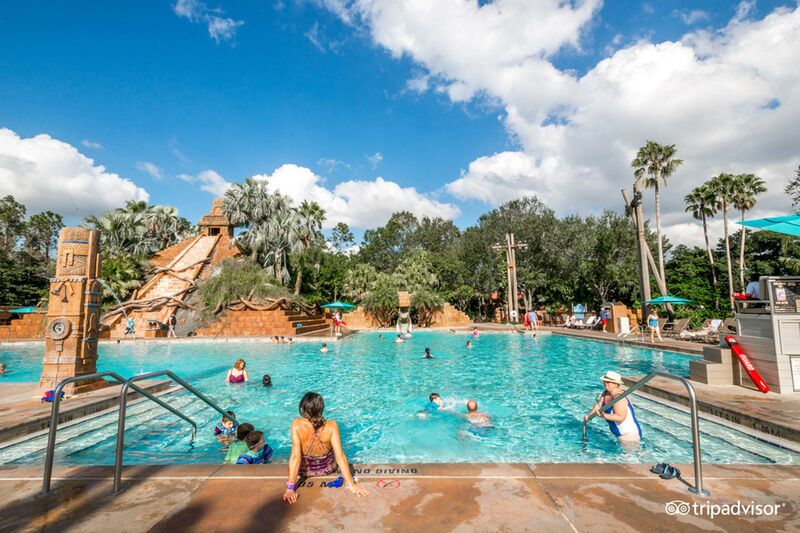 The pool does not have zero-entry access, however, graduated steps in a shallow area, an adjacent playground with swings and the largest hot tub on Disney property provide amusement and “Dig Site” downtime for kids and grown-ups. A Fiesta Pool Party kicks off around 2 p.m. daily, and when the sun goes down, there’s a campfire with marshmallows followed by a nightly poolside movie screening. 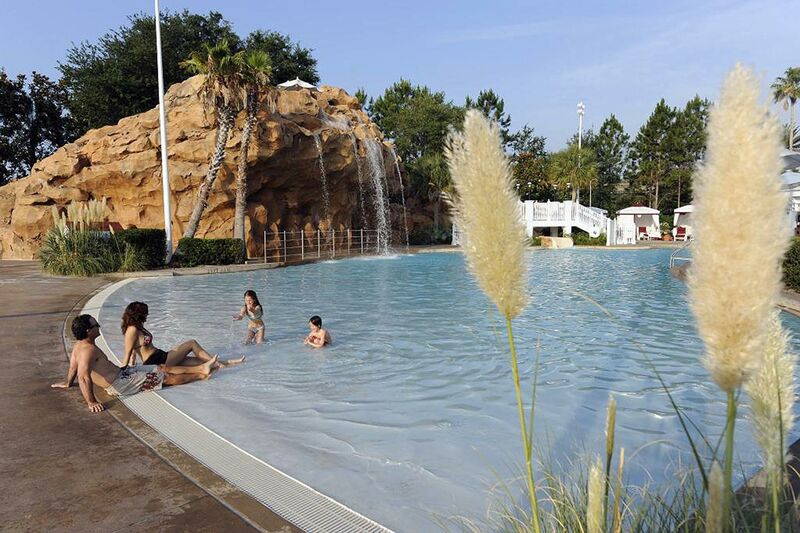 Attractive to parents traveling solo with small children, Bay Cove Pool at Disney’s Bay Lake Towers is small and manageable, with all the features kids (and adults) crave. In addition to zero-entry access and a 123-foot waterslide, Bay Cove Pool features a separate splash area for little ones, daily organized activities, and a hot tub. Gated access means you’ll easily find a beach chair and enjoy plenty of elbow room and poolside dining, a bar, and a separate splash area for little ones set the stage for a period of R&R for parents. Bay Lake Tower is within easy walking distance of Magic Kingdom, making this venue an ideal mid-day break from the theme parks. The showcase Spanish fortress-themed pool at Disney’s Caribbean Beach Resort has water cannons, waterslides, and zero-entry access for little ones. An adjacent Pirate Ship Water Play Area, reserved for kids under 48 inches tall, has mini-slides, sprayers, a dump bucket and a shallow splash area, and offers lounge chairs for parents, as well as a gate for security. Combined, the two areas make a major splash with families.